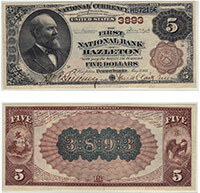 This is the most common denomination that you see on these early bank notes. However, don't assume that they are all inexpensive. Usually even the most generic examples should be worth around $1,000. Based on the bank rarity and condition, the value could be many times that. We would always advise contacting us if you need an exact value. Don't forget to check the serial number. Number 1 notes always sell for nice premiums.